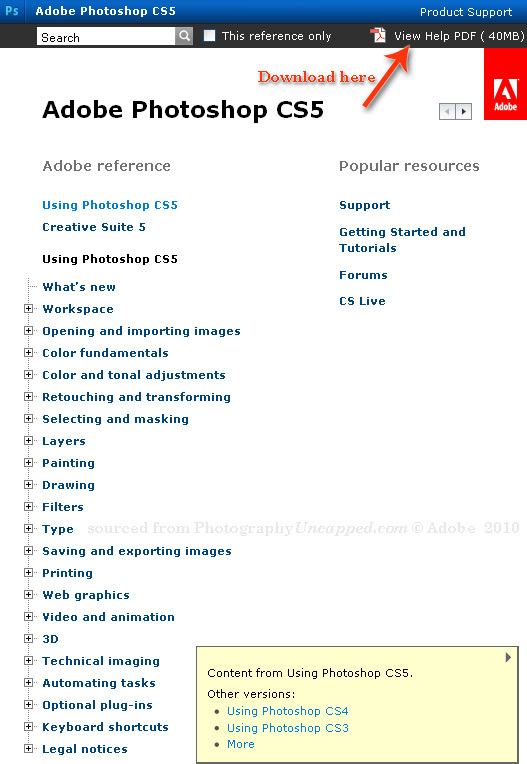 Adobe Photoshop CS5 Help Support pdf is available to View Online or Download the CS5 Help PDF file from Adobe Product Support. The location of the Photoshop CS5 Help file is somewhat hidden. Here is a list of steps to find it, and an animated gif below to show where to click in the various Adobe Product Support screens. Red arrows indicate where to click. or download the CS5 Photoshop Help pdf file for browsing on your computer or device. Once there on that page you may, or may not, be able to bookmark or favorite the link, reports vary as to whether you can return directly to the page at this time. i didn’t know these were posted yet. Yeah, It is a bit hard to find. Glad it’s of some ‘help’ !